On behalf or our family and staff, I welcome you to our 47th Anniversary! Georama Growers has been the Kootenay’s premier source for plants and gardening products.-Since 1970 Georama Flowers has been a Premier FTD Flower Shop with Certified Florists on staff, who will be more than happy to help with all your floral needs, whether it be a wedding, birthday or any of Life’s moments that you wish to celebrate or acknowledge – remember we are here to help! In the Garden Centre let us help you to create and maintain an award winning garden. Our professional design staff will work closely with you in order to make your garden your personal ‘piece of paradise’.Every fruit tree, every rose, each tree, shrub and flowering plant at GEORAMA has been carefully selected and grown to the highest standards. As well as a beautiful array of plants here at GEORAMA, we stock thousands of top quality products to help with every aspect of gardening, from pest and disease control, to water gardening, fertilizers, potting mixes, topsoil, decorative rock, bark mulch, statuary, pots, and so much more. Take your time and browse through our website,This year we have incorporated a new page – Georama’s Plant of the Week feature- just click on the Garden Centre tab and follow the links. I hope you find it interesting and informative. Please feel free to contact us with your thoughts, comments, or questions. Our email address is info@georamagrowers.com. 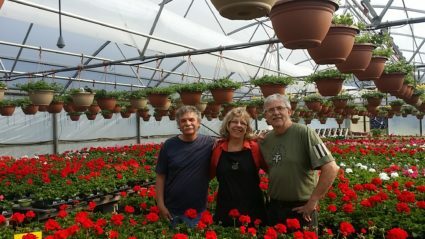 Plan a visit to Georama Garden Centre soon, and we will show you a whole new world of gardening! Sincerely Case Grypma President Georama Growers.